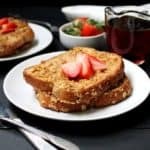 A delicious and easy recipe for Vegan French Toast coated with flax eggs and walnuts, and doused in maple syrup. 3/4 cup walnuts (optional, but nice). Place the walnuts in a food processor and pulse five to six times until the walnuts are finely chopped. Place in a shallow dish large enough to hold a slice of bread. Make the custard by whisking together the flaxmeal, whole wheat flour, soymilk, vanilla extract and maple syrup in another shallow dish large enough to hold the slice of bread. Dip the slices of bread one by one in the custard and coat on either side. I let them soak about 20-30 seconds on each side. Dip the slice of bread into the walnuts and shake off any excess. Heat a skillet and coat with a thin layer of vegan butter or spray on some cooking spray. Place a slice of the French toast on the skillet and cook on each side until golden brown. Serve hot with a drizzle of maple syrup. You can make this recipe with gluten-free sandwich bread, and whisk a tablespoon of cornstarch into the custard instead of the whole wheat flour. You can make it nut-free by omitting the walnuts. You can make it soy-free by using another non-dairy milk, like cashew or coconut.